If I’m going to do this Craft Beer School thing — and I am — I need to make sure my game is in good shape. A couple years ago, when I was writing monthly tasting notes for my paper’s entertainment tab, I was sharp. I still write beer-related stuff for the paper, but most of it is more on the newsy side, rather than writing reviews. So I’m going to make sure I have my touch back between now and May 18, the day I have to stare down 250 people and speak with at least a degree of intelligence about the beers Tony has picked for the night. Yeah, I know — that means lot of hard work between now and then. I hope you’ll suffer along with me. Salvation. The name of two intricate Belgian-style ales, created by us, Vinnie Cilurzo of Russian River Brewing and Adam Avery of Avery Brewing. After becoming friends a few years ago, we realized we both had a Salvation in our lineups. Was it going to be a problem? Should one of us relinquish the name rights? “Hell, no!” we said. In fact, it was quickly decided that we should blend the brews to catch the best qualities of each and create an even more complex and rich libation. In April 2004, in a top-secret meeting at Russian River Brewing (well, actually it was packed in the pub and many were looking over our shoulders wondering what the hell was going on), we came up with the perfect blend of the two Salvations. Natalie, Vinnie’s much more significant other, exclaimed, “We should call this Collaboration, not Litigation Ale!” “Perfect,” we shouted! We celebrated deep into the night (or is that morning?). Fast forward to November 14, 2006. After talking about it for over two years, we finally decided to pull the trigger and Vinnie made the journey to Avery Brewing to brew his Salvation exactly as he does in his brewery. I honestly don’t remember where I picked this up, but it’s been sitting in the beer fridge for a while. I know the beer is a year old, but at nearly 9 percent ABV, a little aging won’t hurt, and might in fact help. I can’t make that comparison, because this was my first taste of this beer. I can say it won’t be my last. Poured into a tulip glass, you see a nice, dark amber beer with tan head that faded quickly to a nice lace. The aroma is right in the Belgian wheelhouse — fruit and sugar, nice and rich. It meets the promise, too — I tasted raisins swirling with sweet malts and the funky Belgian yeast. 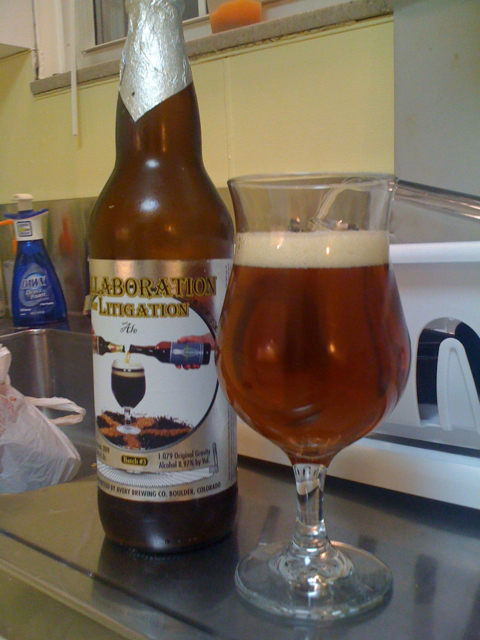 It held its carbonation well, and a little warming made it even better, as I discovered when I forgot about my half-full glass while we ate dinner. There was one surprise — the alcohol is masked almost completely, making this an exceptionally drinkable, and exceptionally dangerous, beer. Collaboration Not Litigation Ale: B+. This is my favorite Avery Beer! My money is that you got this in Ohio cuz yer not finding that around these parts. Next PostNext the best ever.